These are miniature size variable capacitors, perfect for crystal radio projects. 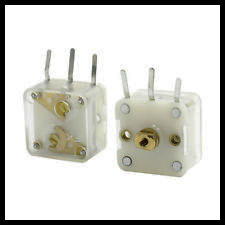 These are small plastic ( Poly ) variable capacitors with dual 0-60pf and 0-141pf sections. You can connect the 60pf and the 141pf sections together to make a 0-201pf variable capacitor if desired. We get these from a couple of suppliers overseas and the electrical characteristics are always the same. However, the physical appearance of these may vary, as well as the length of the shaft. The shaft is only about 1/4" long, but it has a tapped hole in the center to attach whatever type of knob or extension you like. Limited quantities available. Package of one.